Branded flash drives are now as commonplace as the office pen – we’ll help you select the right custom USBs for your next promotion. Despite the fact that USB flash drives have been on the market for nearly two decades, they are still a useful and essential part of our daily lives. Technological advancements like the Cloud have certainly supplanted some of the flash drive’s primary functions, but the devices (also referred to as thumb drives, pen drives, memory sticks, USB sticks, and a variety of other nicknames) still provide a lot of value to a lot of people. They are especially effective as promotional tools. In fact, according to the Advertising Specialty Institute’s (ASI) 2019 Global Ad Impressions Study, custom USB flash drives are among the most influential promotional products in the United Kingdom, Canada, Germany, France, and others. That study also showed that promotional USB flash drives are kept an average of 13 months with 43% of consumers keeping them 2 or more years. Over the course of their lifetime, custom flash drives produce 700 impressions, meaning that, with an average cost of only $5 per drive, each impression typically costs you a fraction of a cent. Utility is a main factor contributing to the effectiveness of these promotional items. In fact, 58% of respondents in the ASI study indicated that they kept promotional flash drives specifically because they were useful to them. Of course, the likelihood that a product will be used is vital to the success of any promotional product campaign because it ensures that more eyeballs will see your branding, ultimately improving brand loyalty and favorability. On top of that, branded USB flash drives are likely to be re-gifted or given away if the initial recipient doesn’t want or need them. A total of 47% of respondents in the ASI study suggested they would give the devices to friends, family members, or co-workers. Again, this maximizes the amount of impressions you will be able to get. Clearly, custom USB flash drives are valuable promotional tools. They also have functional value for businesses in a variety of industries, because they can be loaded up with additional information and marketing material. Catalogs, brochures, product details, photographs, and other data or media can be delivered in a convenient package that virtually anyone can use. All that being said, there are numerous different choices when it comes to custom thumb drives. In fact, some options don’t even resemble the traditional flash drives to which we have all become accustomed. Before we get into specifics, however, why don’t we take a look at some basic information about USB? Most of us have a pretty good idea of what we think the term “USB” represents. We typically have to use USB cords or cables to charge our phones, and our computers and other tech devices usually come with USB ports. The USB connectors and ports we are generally familiar with are rectangular and can only be inserted in one direction. Still, there’s a lot going on behind the scenes with USB (or “Universal Serial Bus”). For starters, USB types are split into two identifying categories: connector type (i.e. what they look like) and speed (i.e. what they can do). For the most part, letters refer to the connector type (e.g. Type-A, Type-B, Type-C, etc.) while numbers generally refer to speed and capability (e.g. 3.0, 2.0, 1.1, etc.). The USB connector type we are probably all most familiar with is the rectangular Type-A (also referred to simply as “USB-A”). It’s been in production since the mid-1990s, and you’ve probably used your fair share of USB-A devices and cables over the last 20 or so years. This also happens to be the most common option for custom USB memory sticks. USB Type-C (or USB-C) is a newer, slimmer option introduced in 2014 that features increased transfer speeds and the ability to plug in the connector in either direction (which has notably been an issue with traditional Type-A receptacles). It also allows users to upload to and download from a device (like a computer) simultaneously. Although Type-C is better in virtually every way, it hasn’t quite caught on with the general public or with many technological manufacturers. Even so, it’s definitely gaining momentum with ports on new MacBooks, Google Pixel phones, Samsung phones, Nintendo Switch controllers, and numerous other devices. If you have a device that doesn’t have a Type-C port, however, you will need to get an adapter to connect to the traditional Type-A port. Fortunately, most custom USB-C flash drives also come with a separate Type-A connector to avoid this common incompatibility. There are other USB connector types including Type-B and various “Micro” and “Mini” options, but, for our purposes, the only relevant ones are Type-A and Type-C. Those two types are the only ones currently being used for USB flash drives. The other way to differentiate between USB devices is by their speed. This is also referred to as their “data rate,” “transfer rate,” or “signaling rate.” The initial USB iteration was the USB 1.0 released in 1996 with a data rate of 1.5 to 12 megabits per second. The USB 2.0 improved on that substantially in 2000 with a rate of 480 megabits per second. One of the more recent USB updates (USB 3.0) again improved on that number in 2008 by a factor of ten with a transfer rate of 4.8 gigabits per second. If all of this seems confusing to you, then just think about this way: USB 3.0 is faster than USB 2.0 which is, in turn, faster than USB 1.0. All Type-C flash drives have 3.0 speeds or better. Type-A flash drives can come with 2.0 or 3.0 speeds, but it should be noted that any USB 3.0 device is going to be backward compatible with any previous incarnation (including 2.0 and 1.0). Obviously, custom USB 3.0 flash drives are really the cream of the crop when it comes to portable data storage. The ability to speedily transfer data is hugely important for many folks in the business world (and probably the espionage world, too). Gifting a USB flash drive capable of 3.0 speeds will also be a boon for your business and brand favorability. Now it’s time to look at aesthetic designs. As you might expect, there are quite a few different design options when it comes to custom USB sticks. Again, not all products that you could reasonably call a USB flash drive will look like the traditional thumb drives we’re all used to. In fact, certain types (like the USB business card) resemble entirely different products altogether. Additionally, virtually all flash drive options can be customized by color to ensure consistent branding. There are numerous color options available, although the amount may vary by flash drive model. Obviously, you will also be able to add your business’ unique logo or other design either through screen printing (which is in color) or laser engraving (which is similar to etching). It should be noted that, at iPromo, all flash drive designs have a customizable amount of storage space, ranging anywhere from 64MB to 256GB. Some allow you to have a greater range of storage than others. You can opt to have them pre-uploaded with data or upload the data yourself once you receive the drives. Some models have the option for a key ring attachment or lanyard, as well. Below, we’ll give you a rundown of the numerous and varied types of promotional USB flash drives that can give your business a boost. When you think of a typical flash drive, you probably imagine a stick with a USB connector on the end. You’re also probably most familiar with capped flash drives which are equipped with a cap to keep the connector safe from damage. These traditional flash drives are intuitive and simple while also offering elegant design aesthetics and plenty of space for your branding. There are several options when it comes to flash drives that have a cap. You can opt for the simple classic style or go the novelty route with selections like the Lego flash drive or one that actually looks like a pen. Either way, your customers are sure to enjoy whichever option you pick. But, there are many more options available that don’t utilize caps or have the traditional flash drive design. There are also numerous custom capless flash drives. The most common capless options are drives that pivot or twist out of a protective shell. This provides you with a unique and functional design that also allows your recipients to forget about the worry of losing the cap. USB drives that incorporate both Type-A and Type-C connectors often use the pivot design so that you can just swivel between one connector type and the other. Other capless flash drives may simply be retractable like a pen or a box cutter knife. Some options use a simple mechanical slide to reveal the connector while others, like the Rubik’s Cube novelty flash drive, require you to spin a portion of the body to expose the connector. Again, these devices allow you to protect the head of the connector without having to worry about losing a cap. You may also notice that certain capless options have what looks like a smaller, deconstructed USB connector. These connectors are typically referred to as “single-sided” because they only feature one side of the traditional Type-A connector. Still, they provide the same functionality and are compatible with all Type-A receptacles. You will find a single-sided connector on various options like the key-shaped flash drive or USB business cards. We’ve mentioned these a couple of times above, but custom USB business card flash drives (also often referred to as “credit card flash drives”) are some of the most innovative options in today’s competitive business world. This is because they act as both a traditional business card and a fully-functioning flash drive. These products are almost indistinguishable from traditional business cards or credit cards and can easily fit in any wallet. The USB connector (which utilizes the smaller single-sided design) flips out of the card and is compatible with all Type-A ports. Beyond being useful, custom credit card flash drives are just cool. How often do you receive a business card that actually provides value to you beyond a phone number and address? You also have a much broader imprint area on the device itself, meaning that you can really be creative when putting your branding on the card. Custom USB business cards are used in a variety of industries and settings. They can be loaded up with general information about you or your company’s products so that you can hand them out to any interested party. But, you can also include information that is specific to a single person or set of clientele. They can also include information that isn’t necessarily promotional in nature. These USB cards could be filled with valuable information for college students at an orientation or even patient information at a hospital. In this case, branding becomes secondary to the information provided, but it is still nice to see that branding even on USB business cards that are exclusively functional in nature. Despite their small size, you can actually add quite a bit of information onto these business cards. Certain models feature as much as 64 gigabytes of storage space, so you can really include whatever you feel is necessary. On top of that, it’s entirely possible (and even probable) that individuals will continue to use these devices even after they have completed their business with you. But, with branded USB flash drive business cards, your company will always be on their mind every time they use the drive in the future, increasing the chance of repeat business. If you’re looking for a slightly more elegant thumb drive, then promotional wood USB flash drives might be your best bet. The wooden exterior provides a touch of class, but you still get the same general functionality as any other USB flash drive. Custom wood flash drives come in either capped or capless designs and are perfect for artistically-oriented businesses. Wooden flash drives are especially effective for photographers looking to dole out images of an event like a wedding or birthday party to multiple people. Artists, writers, and graphic designers will also benefit from the classic wooden design and the ability to load up their own portfolios. Another positive aspect of custom wooden USB flash drives is that you can actually pair them with complementary wooden boxes. These custom presentation boxes provide an additional flair that will help you stand out among your peers and competitors. Also, of course, your branding will be emblazoned on the box for anyone to see. If you really want to get creative, then custom-shaped USB flash drives will be right up your alley. With these drives, you are in control of the exterior design throughout every step of the process. Again, you can opt for a very classic design or you can go for truly novelty flash drives. Do you run a shoe business? You can have a shoe-shaped USB drive. How about a media company? You can go with a newspaper-shaped USB drive. The possibilities are literally endless, and any design you can imagine can likely be implemented. 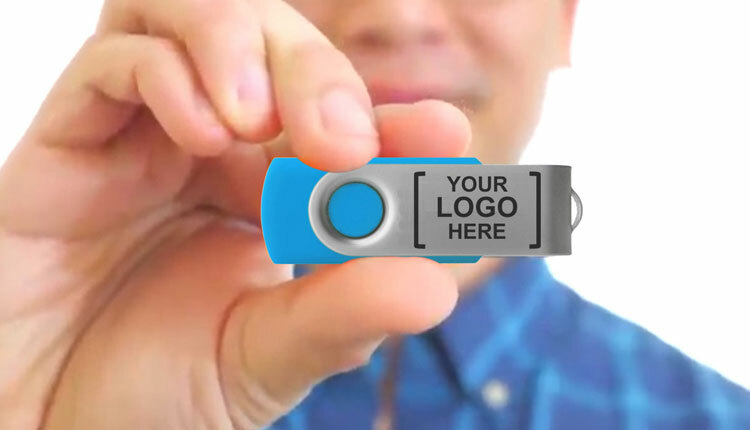 All you have to do is create a concept, approve mock-ups created by iPromo, and then you can have your entirely unique USB memory sticks in as few as 15 days. It’s really that simple. Most designs use a rubbery PVC plastic, but you can also go with a more durable metal or ABS plastic exterior if you so choose. In any event, these flash drives allow your creativity to shine in a way that most flash drive options don’t. It can be a great way to promote a new product (simply create a drive in the shape of the product) or just an innovative way to catch a prospective customer’s eye. In any event, no one will complain about getting the cool flash drive you design. Now that you know all the varied options at your disposal for custom USB flash drives, how exactly do you use them? There are generally two different ways promotional USB drives are utilized: as general “swag” or as a device that contains further marketing or functional information. In most cases, a custom USB drive is both. If you want to go the general swag route, you can just order a bunch of USB drives and hand them out at conferences, trade shows, or directly to clients as you see fit. There is no need to include any documents or files if you don’t really want to do that. As we mentioned above, USB drives will be used regardless of whether there is any information on them at the start. Also, as we mentioned earlier, not all custom USB drives have to be promotional. They can also be used by employees within a business or institution. The health care industry notably uses flash drives to store patient data (among other uses). These are just a few general ideas for how to use USB flash drives. But, let’s take a look at a few specific industries to see how they might utilize custom flash drives to their benefit. We’ve already mentioned it a few times, but USB flash drives are often used in the health care industry. Most notably, they store sensitive patient data and information. This is a great way to ensure that all of those important details are readily available and are not easy to steal by hackers looking to retrieve data from a centralized system. Custom USB wristbands or bracelets have been used with some regularity because they don’t get lost easily. These devices simply clasp around the wrist, and, when you unhook them, they reveal the USB connector. It’s a great way to keep all relevant patient data in one safe location. USB business cards have also been used for this purpose, although it may be easier to lose those. A growing number of hospitals is using custom USB bracelets, because they are simply so easy. In a high-stress environment like a hospital, it’s important to be able to access valuable data at a moment’s notice. It’s also a great way to keep medical records safe in the event that physical records get lost or the main computer system is compromised. Of course, USB drives in the health care industry aren’t limited to hospitals or clinics. In fact, any business that operates in the health care field can use custom thumb drives for a wide variety of reasons including for the introduction of new products or just as general swag. There’s no question that college students love swag. They also love convenient things. During new student orientation, they will generally receive a ton of flyers and other goodies that are filled with information about the campus and what they can expect during their time there. Of course, it’s much easier if all that information is accessible via custom USB flash drives. Not only will it put their minds at ease, but it will also provide them with a useful tool that they can utilize during their studies. It also can’t hurt to engender a little school spirit. Flash drives are also valuable as a recruiting tool. Whether you’re recruiting for sports or a particular field of study, being able to show off everything the school has to offer on one little device is certainly handy. In general, you may want to consider attaching a lanyard or key ring to reduce the chance of the device getting lost. USB business cards are also great for colleges, because, again, they can fit inside any standard wallet. College kids understandably have a lot on their minds, so making it easier for them to store an important flash drive is key. There are a lot of different ways you can use custom USB memory sticks in the fields of construction and architecture. First of all, it’s a great marketing tool for bringing in new customers. You can upload numerous images and write-ups detailing your qualifications and past projects. For example, if you specialize in residential remodels, upload a bunch of before-and-after photos with descriptions so that prospective clients can see and understand what a great job you do. Again, USB flash drive business cards may be your best bet for this one, but any flash drive will likely do the trick. You can also opt for the paper clip model that can keep any physical documents neat and tidy as well. If you’re a realtor or you work in real estate in some capacity, there’s no question that a custom USB pen drive can help you. For starters, you’ll be able to provide a full listing of all the houses you are showing. This allows prospective customers to peruse their options at their own leisure. After a client has closed, you may want to reward them with a nifty little USB key that symbolizes the key to their new home. In addition to closing documents, it can provide information on insurance or recommendations on quality construction companies for any future renovations or repairs. General business – Most businesses have something to sell. USB flash drives are a great way to let current and future customers know about your products, while also giving them an incentive to choose your business. Flash drives can even be used internally for things like quarterly reports or shareholder briefings. Restaurants and food service – A custom-shaped USB flash drive might be a great way to attract new clientele. If you own a sushi restaurant, you could easily come up with a California roll-shaped USB drive that comes uploaded with a menu, locations, and other details. Accounting and finance – During tax season, it’s important for clients to get all of their requisite documents in order. There’s no better way to deliver that than with branded USB flash drives. You may also earn repeat business the following year because of it. Hospitality – If you’re trying to attract guests to your hotel and resort, a flash drive may do the trick. It can include brochures, room previews, group rates, and a list of local events and sights that may intrigue prospective guests. This is especially helpful if you’re trying to attract large groups. Legal industry – Lawyers and law firms have a lot of paperwork. It’s important to keep your clients informed and a flash drive can make that job a little easier. Again, USB business cards are good for this. They can also help attract new clients with information like past successful cases and types of law you commonly practice. Government Agencies – Cities, counties, school districts, and other special districts often need to get information out to employees and the general public. Development and economic plans along with numerous other governmental details can easily fit on most flash drives. Non-profit organizations – Flash drives could make a great and inexpensive gift for donors. Non-profits could also resell the devices to earn more money. This should not be taken as an exhaustive list. If you work in a different industry, then you can certainly identify how much value a USB drive can have for you. Many people might think that a flash drive is more or less obsolete in today’s digitally interconnected world. Because of this, they may not believe that custom USB flash drives have much value for their recipients. Of course, that couldn’t be further from the truth. Taking your web browser with you – Google Chrome is one of the most commonly used web browsers, and there’s also a portable version conveniently called “Google Chrome Portable” that can be loaded onto a flash drive. So, if you ever have to use someone else’s computer, you can pop in your flash drive and run Google Chrome with all your favorite settings and extensions. Taking any app with you – Programs like PortableApps allow you to haul around all your favorite applications like Microsoft Office or Safari on USB drive. So, no more worrying about computer compatibility. Finding and eliminating viruses – PortableApps also provides a wide variety of antivirus software that you upload onto a thumb drive. Simply plug it in, run the antivirus program, and see if you have a virus lurking on your computer. Locking and unlocking your desktop – Passwords are the typical method for keeping people out of your computer. But, programs like USB Safeguard or PREDATOR allow you to literally use a flash drive as a key to lock and unlock your computer. Without the key, the computer is virtually disabled, allowing you to rest easy in knowing that all your information will be safe and only you can access it. Creating a recovery drive for Windows – There’s nothing more gut-wrenching than watching your computer die. But, if you create a recovery drive, you may be able to keep your computer running and your documents from being erased from existence. Improving your PC’s performance – A popular program called ReadyBoost can help your old, languid computer get a new lease on life. You can basically cache certain programs and systems on the flash drive, allowing the computer to focus only on its core, necessary functions. Of course, there are plenty of other hacks you can use to fully maximize your USB drive. In any event, it’s clear that custom USB flash drives have maintained their utility even if other 20 year-old tech products have kicked the bucket. It’s also clear that they provide value to clients, employees, students, freelancers, and virtually anyone with a USB port on their computer. If you’re interested in getting your own set of bulk USB drives, contact us today.